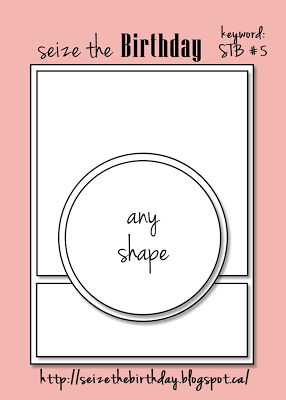 Here's my card for this week's Seize the Birthday#5 feminine card challenge. I used all SU! products for my card. I added a hodgepodge hardware vanilla brad to the center. Quick & easy, and I really like how this turned out! We dodged Mother Nature this time and only got about an inch or two of snow. The winds picked up, but the sun is out and will melt most of this snow I'm sure. I hope our friends up north in new England are faring well after being dumped on with this snowstorm! Stay warm, and thanks for stopping by! I love your choice of colors. I wouldn't have headed to blues for a feminine card but it's perfect - the polka dots, embossed flowers and detail on the blue flower seem even more feminine! Beautiful card Carol. The medallion is stunning and I love your choice of colors. Thanks for joining us this week at Seize the Birthday. CAS and gorgeous!! Love the embossing and that DP, Carol. The medallion is perfect for this. SO PRETTY! Glad y'all didn't get hit too bad by the blizzard!! That flower just pops Carol!! 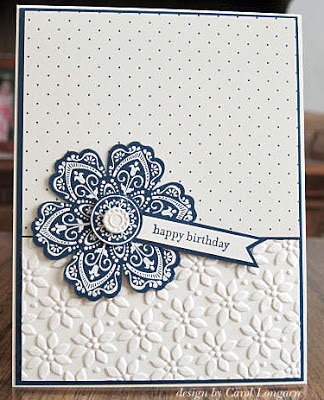 I love the embossed base and the flagged sentiment shooting out from the flower. Thanks for joining us at Seize the Birthday! This is breathtaking beautiful Carol! very pretty Carol, I really like that medallion, it really pops out on your card. Did you heat emboss that with white embossing powder? Oh, that's a beautiful flower AND card. I love the simple design, too. I'm surprised you didn't get more snow. I thought I was going to find some nice snow photos when I came to your blog. Carol your card is elegant. I checked out your blog and enjoyed all of your creations and you listed this challenge. Cool. Very Pretty! Love that image stamped in white on colored CS!! I finally got this challenge done and on time for once. Really pretty, love the elegance! 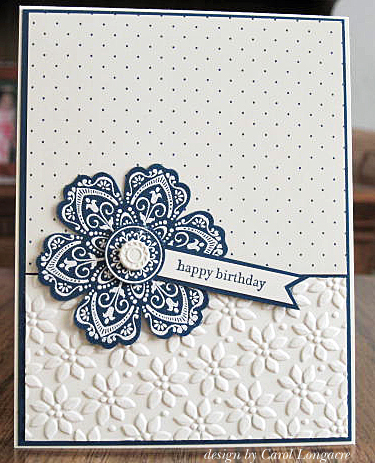 Just white and a beautiful blue make such a wonderful card! Hope you're keeping warm.